Containment Protocols: RPC-760 is to be kept in a modular airlocked reinforced steel containment chamber in the Terran-Gamma containment sector of Site-002, with external refrigerant cooling the interior to temperatures of -20oC at all times. Feeding will be undertaken every three days provided from a 5x5cm chute consisting of vitamin pills to keep RPC-760's body mass at minimum levels. The containment chamber holding RPC-760 is to be equipped with electromagnetic generators that produce a magnetic field in reverse to RPC-760's polarity. The sensors along with the cooling system are to be inspected on a daily basis for any damages. Body mass of RPC-760 must not exceed 45kg. In the case of exceeding this body mass limit, the interior temperature is to be dropped under -50oC and two specialized robotic arms used to dismember one of RPC-760's limbs for incineration. Under no circumstances should any organic tissue enter RPC-760's containment chamber. Any successful or attempted access to the chamber will be met with disciplinary action and possible reassignment. Cleaning of the containment chamber is done by specialized housekeeping drones every 24 hours. During testing, the modular containment chamber is to be transported to the Secure Testing Sector of Site-002 with all personnel evacuated from the testing chamber. RPC-760 may be given an organic mass not exceeding 150kg (accumulating to its total weight). After the testing session, the same protocol of RPC-760 gaining major body mass is to be undertaken. All instances of RPC-760-1 and RPC-760-2 are to be terminated immediately. During containment, RPC-760 shows little-to-none activity to keep its energy usage low. Any changes in behavior should be reported to the assigned Head Researcher immediately. The containment chamber holding RPC-760 and RPC-016-5 must be located at least 5 levels away from each other to avoid the AM-760/016 Scenario. See Addendum 760-03. Description: RPC-760 is a prosarmorphic1 humanoid entity often appearing as a human Caucasian male measuring 180cm in height, 45kg in weight with a slim build due to its required malnourished state. X-ray and MRI scanning of RPC-760 indicates of a body mass dominated mostly by heavier elements instead of water with 40% of its mass comprised entirely of carbon atoms. RPC-760 possesses the ability to manipulate its own body mass into any form it has in its knowledge, with the most frequent form being weaponry that materializes out of its arms. RPC-760 is also able to absorb organic tissues by direct skin contact to attain body mass. 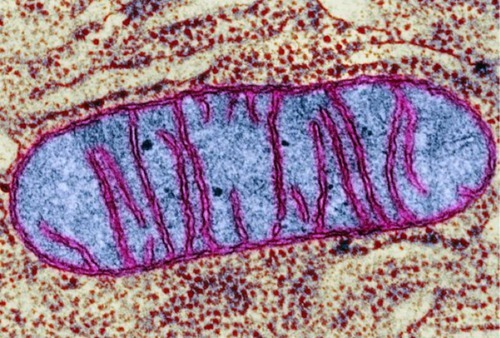 A sample of RPC-760's mitochondrion viewed through an electron microscope. RPC-760 achieves these feats by emitting a unique form of ultraviolet wave with a strong localized magnetic field that breaks molecular bonds and manipulates resulting radicals to synthesize complex chemical substances. RPC-760 has shown to possess extremely efficient mitochondria that produce a luminescent compound which emits said high energy ultraviolet light used for homolytic fission of chemical bonds. On rare occasions, RPC-760 will implant a mass of its tissue to the vertebrae of nearby subjects. The tissue injected will attempt to bond with the subject's DNA and restructures the function of their brain and body drastically. Subjects who are failed to bond with RPC-760's DNA will exhibit flesh growths in various parts of their body (Designated as RPC-760-1). Subjects who are successfully bonded with RPC-760's DNA will make a subject with abilities similar to RPC-760 (Designated as RPC-760-2). The process has a 22% chance of creating an instance of RPC-760-2. 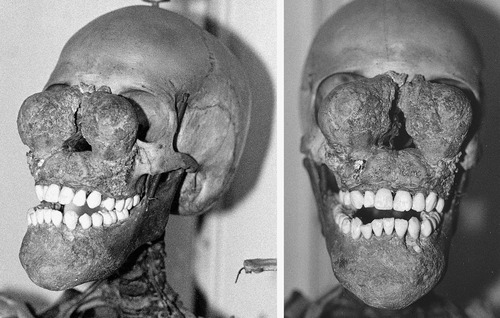 The skull of a terminated instance of RPC-760-1. Extensive research suggests that RPC-760 was created due to random fluctuations out of a state of thermodynamic equilibrium (i.e. Boltzmann Brain). This theory is reinforced after numerous incidents where RPC-760 regenerated completely even after being completely disintegrated (See Incident Report 760-01). The self-defense measures produced by RPC-760 often take the form of rapiers made of a unique form of a carbon fiber reinforced polymer that is extremely light and shows excellent stress resilience up to ██kN. RPC-760 has shown to direct its unique carbon molecules outwards of its body to create an armor-like exoskeleton. RPC-760 is generally reticent, although it has made several statements on rare occasions, mostly containing vulgar travesty to researching personnel. Appendix 1: Recovery Log: RPC-760 was recovered in a barn near the city of ██████, ██ after several reports of a humanoid entity appearing akin to the Wendigo figure butchering several farm animals. At the time of recovery, RPC-760 had amassed a body weight of ███kg. It has been confirmed in Interview Log 760-01 that RPC-760 is indirectly related to ████ Davidson, the creator and a former host of RPC-016. In ██/██/████, ████ Davidson have been using the laboratory equipment of his workplace—The ██████ institute—to experiment on biochemistry. It is theorized that ████ Davidson reverse engineered RPC-760's attributes to create the five instances of RPC-016. Regarding the re-containment of RPC-760. The following procedure will occur in the event of a containment breach with RPC-760 has successfully escaped its containment chamber. All non-essential personnel are to evacuate the sector. Re-containing personnel are to distance themselves at least 15 meters from RPC-760. Re-containing personnel are to target RPC-760's limbs—most notably its legs—with Authority NS-760 "Splicer" tool. Once immobilized, RPC-760 is to be sprayed with liquid nitrogen from portable tanks and brought back to its containment chamber. Below is a copy of the first interview log of RPC-760 conducted by Dr. Mercer dated ██/██/████. Foreword: Dr. Mercer is investigating the origins of RPC-760 and its anomalous traits. RPC-760 is interviewed through the intercom in its containment chamber. Internal temperature is raised to -5oC for the duration of the interview. Dr. Mercer: Do you have a name? Or something that can identify you? RPC-760: Of course, my name is Alex Davidson. Dr. Mercer: Well, a number of our researchers have noticed a similarity between your traits and another object. Do you have any relations to RPC-016? RPC-760: I'm sorry, what is that? 1. Changes shape by adapting to its surrounding environment.